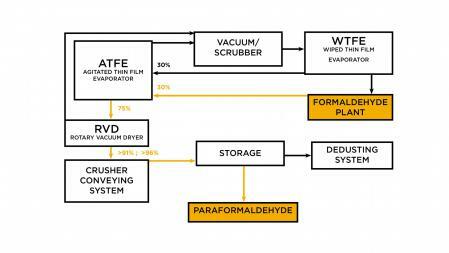 3V Tech supplies equipment and systems to produce paraformaldehyde up to 97% formaldehyde concentration from aqueous formaldehyde. The process is based on the correct combination between a Thin Film Dryer TFE and a Paddle Dryer EC. It is a modular plant built in several lines. Capacity of each line depends on the equipment size and product specifications. This technology assures the highest concentration, a lower energy consumption and a compact lay out.